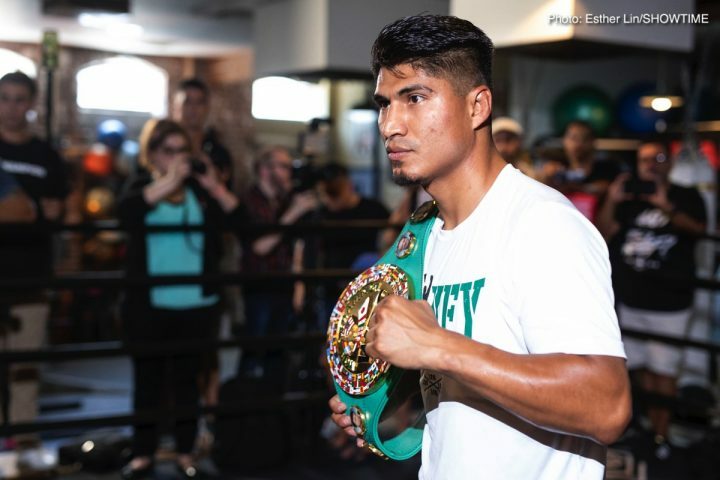 By Sean Jones: Mikey Garcia feels he’s got the edge over Errol Spence Jr. in the skills department, and he’s going to use that edge to defeat him on March 16 at the AT&T Stadium in Arlington, Texas. Mikey, 31, says that Spence’s size won’t be a factor. The skills will be the difference in the fight, and he believes got the edge over the 28-year-old. Mikey (39-0, 30 KOs) will be challenging Spence (24-0, 21 KOs) for his International Boxing federation welterweight title on Premier Boxing Champions on FOX Sports pay-per-view. The televised fight card kicks off at 9:00 p.m ET / 6:00 p.m. PT. Mikey isn’t worried about Spence having more fans on the night of the fight at ringside at the AT&T Stadium in Arlington, TX. Mikey says that he’s a lot of boxing fans worldwide, and he believes that they’ll come to see him. The fans aren’t going to change the outcome for this fight. Spence proved in his fight against Kell Brook that it doesn’t matter if he’s fighting in front of a crowd that doesn’t favor him. Spence will likely have the fans on his side on March 16, since he’s from Texas, but if the fans are mostly cheering for Mikey, it’s not going to riddle away at his self confidence. Spence is naturally confident. “I just saw a lot of things,” Mikey said about having spotted a lot of flaws in Spence’s game that he can exploit. “As a fighter, you sees things as a fighter that the media never sees. We have a different eye. Everybody sees the size disadvantage, weights, the height, all that stuff doesn’t matter. I’ve seen some stuff that gives me confidence. My boxing ability by itself, that’s it. Not to be disrespectful, but I feel I’m the better boxer than him all around. Maybe not by a lot,” Mikey said. Mikey isn’t saying what he and his trainer Robert Garcia have seen in Spence’s fights that they feel they can take advantage of in this fight. It’s got to be something big for Mikey to feel like he’s got such a great chance of winning this fight. It could be the way that Spence took his time in his recent fight against Lamont Peterson last year in January 2018. Aside from the fifth round, Spence fought in a slow manner, and let Peterson have his moments. In the 5th, Spence suddenly turned it up full blast and knocked Peterson down and had him close to being stopped. In the sixth, Spence went back to toying with Peterson like he’d been doing throughout the fight. “He reminds me a lot of me actually,” Mikey said about Spence “The way he fights. He’s a fighter that technically does almost everything right at the right moment. He reminds me of me, but I think I’m a better fighter,” Mikey said. Spence fights a lot different than Mikey does. It’s unclear what Mikey is talking about in saying that Spence fights like him. There’s no comparison. Spence is a body puncher, who attacks all out from the opening bell. In contrast, Mikey likes to hold back and look for openings to land his hard left hooks and right hands. Mikey has had two fights at light welterweight against Adrien Broner and Sergey Lipinets, and he didn’t look particularly powerful in either of those fights. Mikey didn’t attack Broner or Lipinets in the same way that Spence would have done had he fought those guys. Spence would have been all over both of those fighters, and he’d have likely stopped them no matter defensive they were. Mikey doesn’t have the power at 140, and he’s likely not going to have power at 147 either. Mikey is working out at Victor Conte’s SNAC facility in beautiful San Carlos, California, but the added bulk that he’s putting on likely won’t result in a big surge in punching power. Spence says Mikey looks like ‘”Kangaroo Jack on steriods” with all the muscle he’s packed on. Mikey is going to need to put on a lot more muscle, but he needs to focus on his chin because that’s where he’s going to have problems. Even if there was a way for Mikey to increase his punch resistance from working out at the SNAC facility, it still wouldn’t help him take Spence’s body shots. He’s a body puncher, so it really doesn’t how much muscle weight Mikey puts on or how good his stamina is. If Mikey can’t handle Spence’s body shots, then it’s game over on March 16. It’s not a good thing that Mikey has never fought a body puncher other than Orlando Salido. That fight wasn’t a full fight due to Mikey bowing out after he suffered a broken nose. Moreover, Mikey was fighting with his left hand far out in front of him, and using it to push off illegally against Salido to keep him from getting close to throw body shots. The referee should have penalized Mikey for using that move, but he didn’t. He left Mikey push off on Salido the entire fight. It’s very likely that Mikey will try the same move against Spence, and dare the referee to do his job of giving warnings and taking points away. If it’s quality referee, they might penalize Mikey, but not likely. Spence’s ability to throw body shots could be compromised if Mikey is allowed to hold his left out in front of him and shove him like he did against Salido. Spence has more than just body punching to give Mikey problems. He’s got a hard left hook and right hand that he uses to wear down his opponents. “I don’t consider that a big advantage,” Mikey said about the experience that he has compared to Spence. “At this point, he’s a world champion. He’s been to the Olympics. It only goes so far, the experience. When I fought [Orlando] Salido, he was the man at featherweight. I was up and coming. I had my first title fight against him. A lot of people thought experience would be the determining factor, but I showed everybody that skill is determining the winner,” Mikey said. Easily the best out of that bunch is Orlando Salido, but Mikey’s win over him was an incomplete victory in 2013 due to the fight being stopped in the 8th round at the request of Mikey’s trainer Robert Garcia after he suffered a broken nose. A lot of fighters still keep fighting when they suffer a broken nose, but Robert wanted the fight to be stopped. The ringside doctor went ahead and had the fight stopped. Perhaps it was just a coincidence that Mikey had gassed out at the time the fight stopped. He was no longer dominating Salido like he had in the earlier rounds. The fight went to the scorecards and Mikey won an eight round technical decision. The more experienced fighter didn’t win that fight, but only because the fight was stopped after eight rounds. We’ll never know if Mikey would have won the fight if it had gone on much longer, because he was tired and taking punishment from Salido and not handling it well.